Daniel Lupkovich is on a mission, and he’s not going to let a bunch of plastic water bottles get in his way. Daniel, a third-grader at Sanfordville Elementary School, intends to protect the Earth and is a founding member of the school’s new Green Cub Club. The students meet once a week in Room 209, and there they strategize ways to make their school, their community, and their planet cleaner and greener. 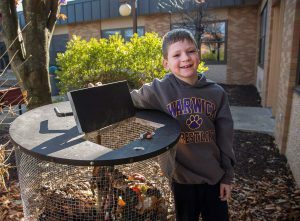 Daniel Lupkovich, a founding member of Sanfordville Elementary School’s Green Cub Club, and one of the school’s compost bins. Food scraps like apple cores and banana peels are collected, and the resulting compost will nourish the school’s flower beds and gardens. Daniel, says Principal Johnna Maraia, is among the school’s leading recycling advocates and a true steward of the environment. The Green Cub Club, she said, has organized the collection of empty water bottles, and Daniel volunteers to recycle them each week at a local supermarket. The club also maintains two compost bins in the school’s courtyards, and in the spring the compost will be used in the gardens and flower beds. “I admire his energy and his dedication and I’m proud of how he’s stepped up,” Ms. Maraia said. Most recently, Green Cub Club members have led a campaign reminding their classmates not to let the water run while they brush their teeth. The Sanfordville Green Cub Club is part of the Warwick Valley School Districts larger environmental efforts, which include an array of initiatives. Among them: water refill stations where students can refill their reusable water bottles have been installed in the school, florescent light bulbs have been replaced with energy-conserving LED bulbs, and the district’s Solar Project on Sanfordville Road will soon generate approximately 2.9 million kilowatt hours of electricity each year.